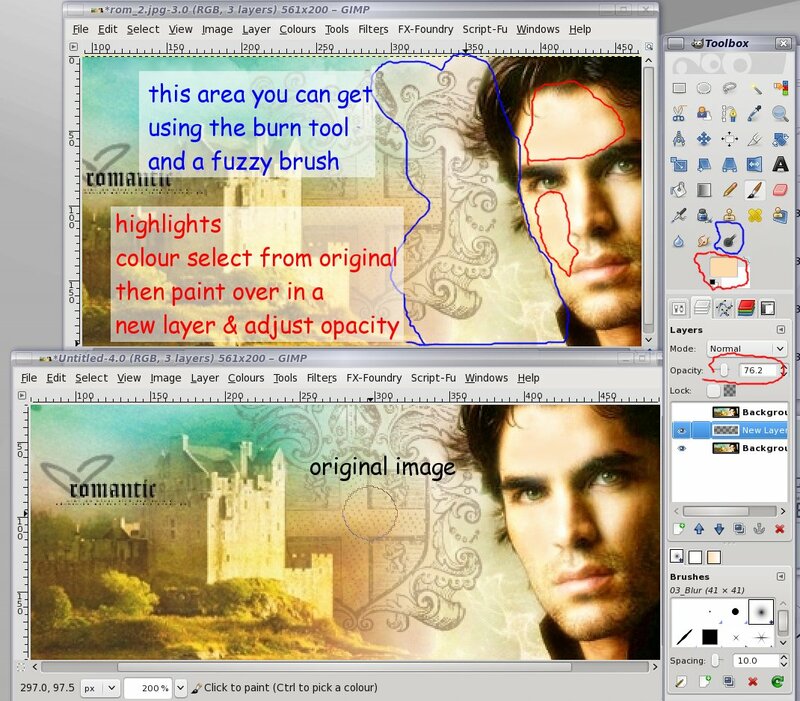 GIMP Forums / GIMP / Beginners / Change brightness in one area? Quick question: How would I go about making the side of his face less bright, please? I can't figure out how to isolate just that one specific area. (And I no longer have the xcf file saved). I also noticed that after using the color and saturation tools, there are red lines on the scruff of his cheek. (I discovered that those lines were on the original pic, but they just became more visible after working with the color/contrast/etc). Is there any way that I can "smooth" those red lines without making it look like the dog's breakfast? RE: Change brightness in one area? Is that image the full size one ?? A 2 minute fix, you can do a lot better. The highlights on the head are too far blown for burn. Make a new layer, select a skin tone and (selectively) paint over. Adjust the opacity to suit. Thanks for the suggestions. I'm going to give it a go right now. I'll probably make it look worse, but at least I have some direction now. Okay, here's what I've got so far. Just bear in mind that I'm a newbie still. I've learned in the past that sometimes there are mistakes on a siggy I make which I can't see on the computer I made them from... yet on a different computer I'll see those flaws. This drove me crazy! My brother the computer whiz told me it's just because calibrations on computers are all different. I HOPE there are no in-your-face flaws this time. So here's what I've done so far. I changed his eye color (I believe this is my favorite new discovery which I'll definitely be using a lot), then tried to darken the brighter areas of his skin; right side of face and forehead. I decided to leave the scruff on his beard alone (reddish lines). I know my limitations. Be forewarned that the new skin color is still pretty bright. On my computer I can see a difference, but it's SLIGHT. If it looks exactly the same from where you're sitting, please tell me. (Personally, I can't see much difference until I have all three layers in one file in GIMP and then preview them from there). I should have made his skin a lot darker, but I was afraid of making it too dark. I didn't want him to look like George Hamilton with a bad tan. Lol! Which pic - if any - do y'all think looks better? Does the skin tone in the last banner look too weird? I think I like Edited Banner # 1 best, but still... I think the skin needs to be a bit darker? Honestly, I keep waffling between the two edited banners. My mother likes the last one best. And please remember that I'm a newbie at all this. If you see flaws I can't see - such as brush strokes - PLEASE tell me. It doesn't have to be perfect, but if brush strokes were visible I'd be so embarrassed.